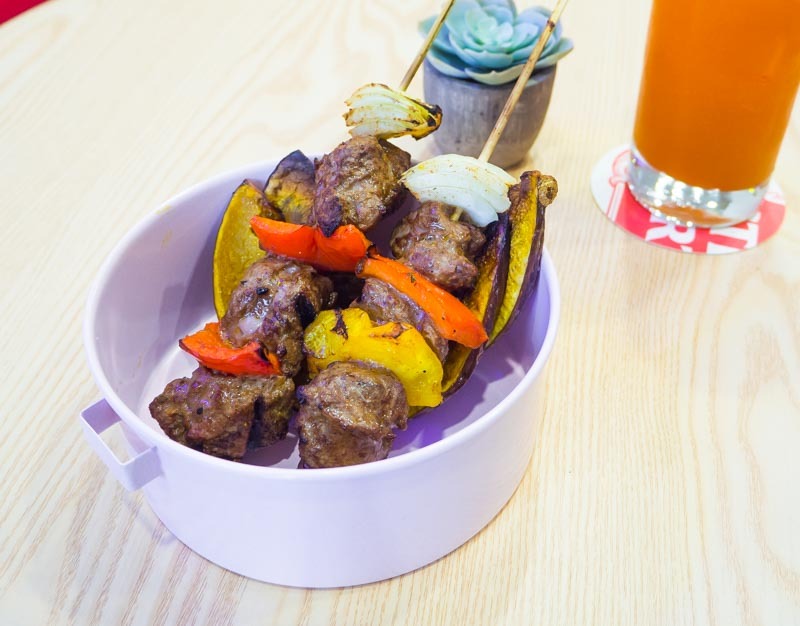 There’s a new tapas (Spanish appetisers) place in Serangoon that you need to check out. 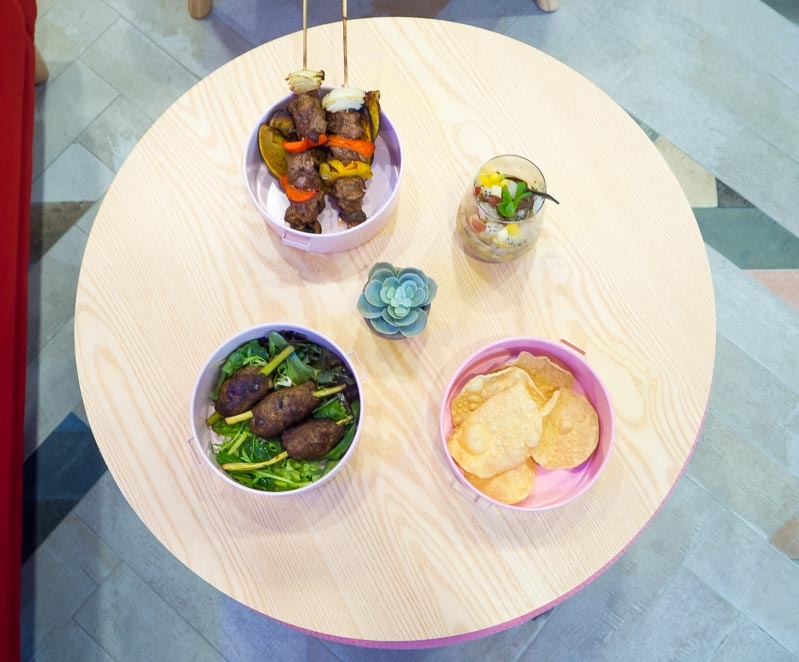 Setting up shop a five-minute walk from NEX, Scissors Paper Stove delivers some superb Spanish tapas, with an Asian twist! 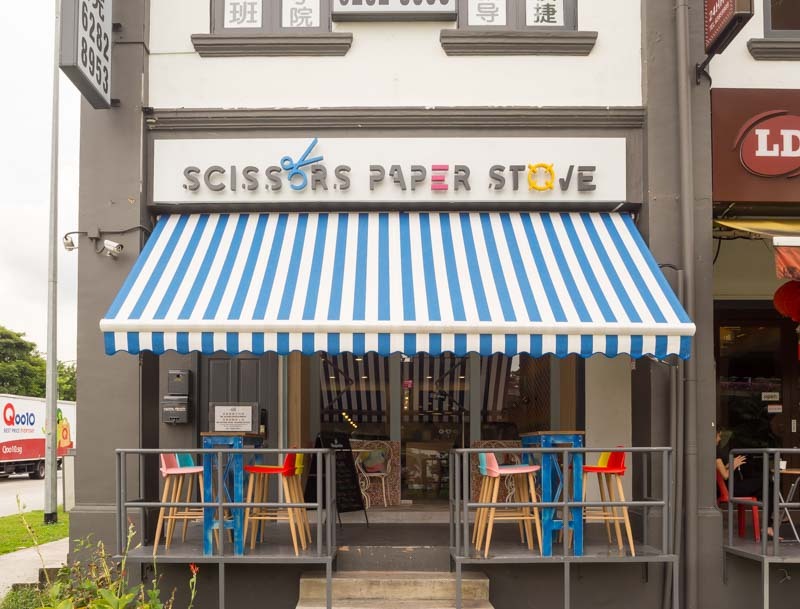 The name, Scissors Paper Stove, alludes to the old-school children’s game of ‘scissors-paper-stone’, which is quite apt as each tapas has a nostalgic touch of homey Asian flavours that would remind you of your grandmother’s cooking. Once you step in, you’ll be greeted by the interior’s vibrant splash of colours. The space itself is rather cosy, decked out with plush cushioned chairs and family seating perfect for sharing the tapas. There’s also a bar if you’re looking for a revitalising mid-day drink. Normally, I’d skip appetisers and go straight for the mains, but with the tapas uniquely served in these colourful tingkats (tiered Chinese lunch boxes), there was no way I was skipping out. The tapas are priced according to the number of dishes you order. Naturally, the more you get, the cheaper each dish becomes (two tapas for $20, four for $36, six for $48). With over 15 tapas to choose from, you’ll be spoiled for choice. If you aren’t sure which tapas to get, start off with this trio of Beef Skewers ($11 a la carte). Grilled then oven-baked, the beef was cooked till tender and was not too gamey. The best part of the dish, however, was the homemade Thai chilli sauce served together. Adding a punchy sourish kick, the sauce really elevated the flavours of the beef. I would have preferred if the chilli sauce was a little spicier though. 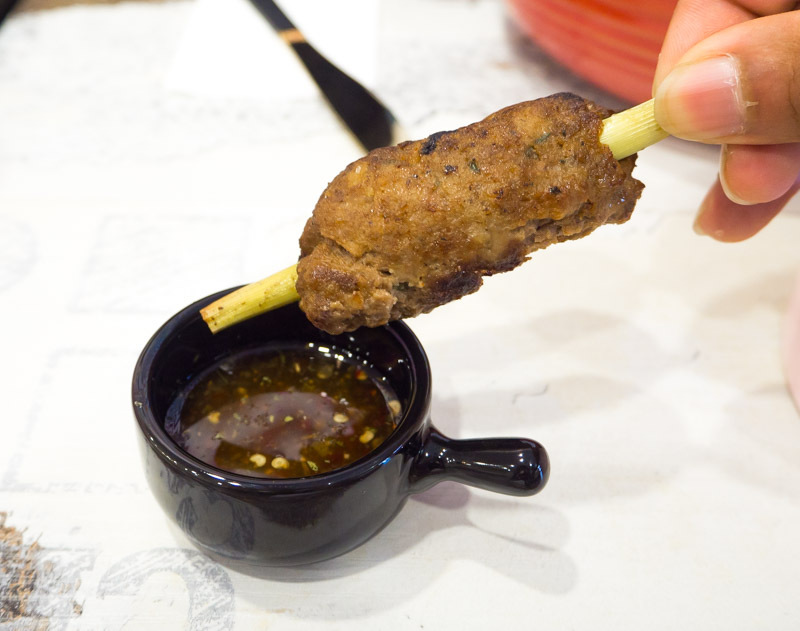 Lamb may be a less popular choice for protein but you’ll regret not trying this tingkat of Lamb Kebabs ($11 a la carte) that turned out to be our favourite of the tapas. The lamb was charred beautifully and even had a slightly smoky flavour, which was balanced out by the aromatic infusion of lemongrass. While the lamb could have been a little less chewy, we thoroughly enjoyed the gamier taste of the meat in this instance. 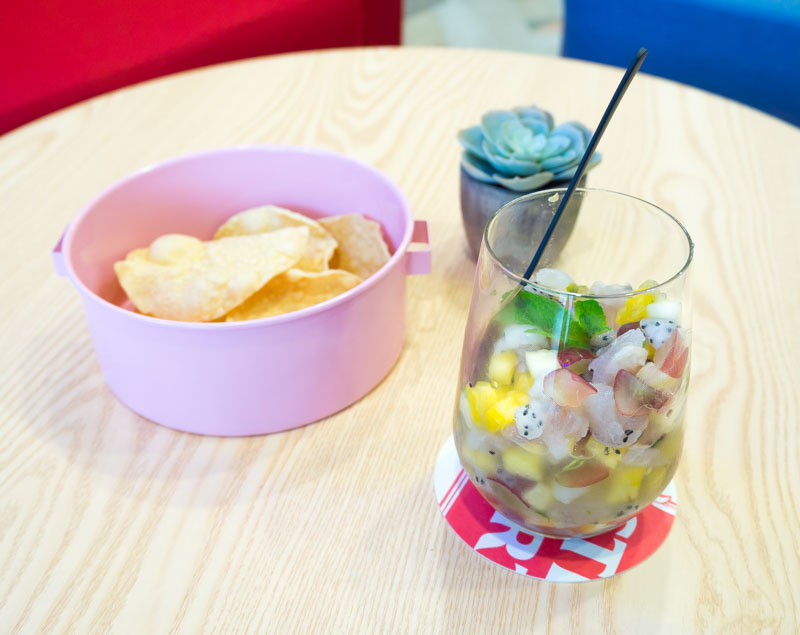 For something with a little more Asian flair, try their Ceviche ($11.50 a la carte). Instead of the usual ingredients of tomatoes, onions and chillies, the cured sea bass is paired with familiar tropical fruits such as dragonfruit, kiwi and mango for flavour. What’s even more interesting is that it’s served together with a tingkat of pappadum, like the ones you find in Indian restaurants. 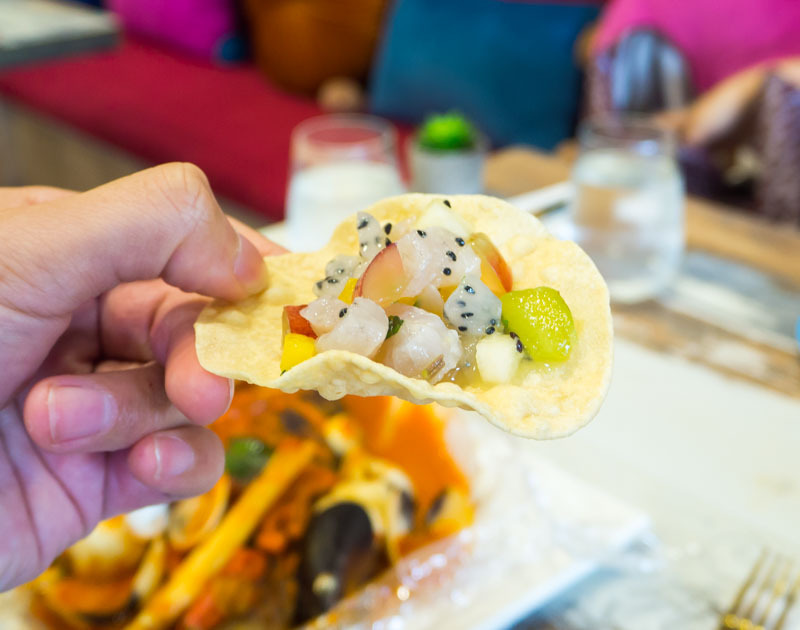 The pappadum made for an interesting crunch and surprisingly went well with the refreshing tangy flavours of the ceviche. However, I felt the Ceviche was missing spice for the extra oomph. The mains tend to stay true to the Spanish classics, such as their best-selling Cartafata ($28). 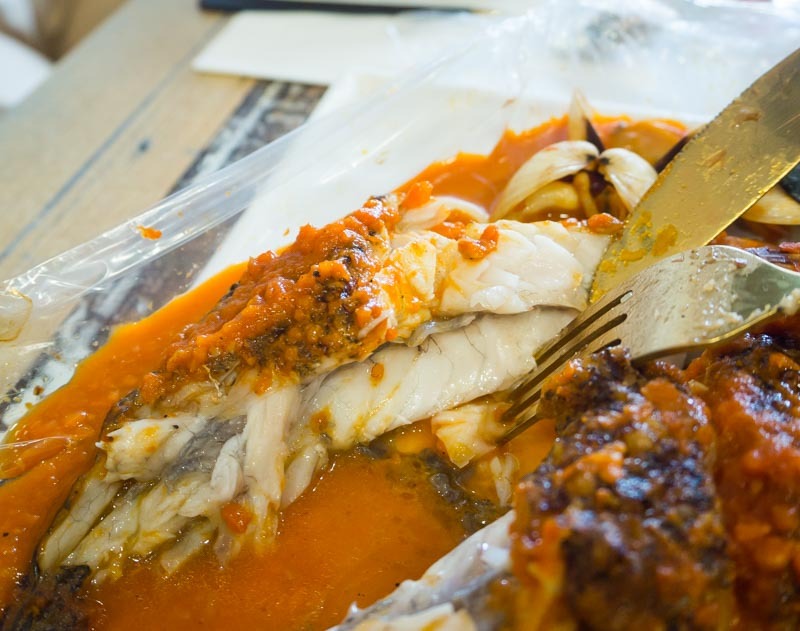 Wrapped in heat-resistant carta fata paper before being oven-baked, the grilled sea bass is cooked as such so as to retain more moisture and flavour. When I opened the little package, a strong savoury aroma wafted up my nose. But it wasn’t as gratifying as tasting the flaky flesh that was seriously tender. 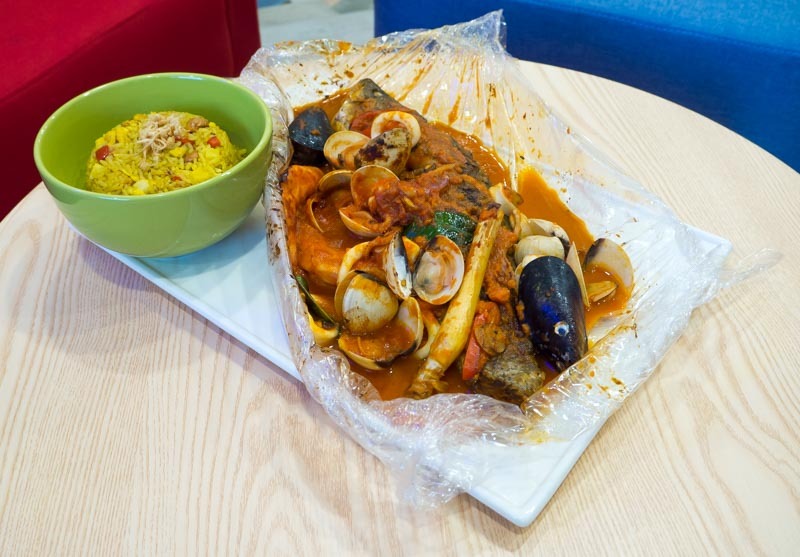 The accompanying stew that the dish was cooked in also brimmed with assorted seafood, including mussels, prawns and clams, served together in a rich and spicy tomato broth that tasted like Italian marinara. To fully enjoy this dish, have the stew together with the fragrant Thai yellow fried rice — yup, Asian flavours all around! 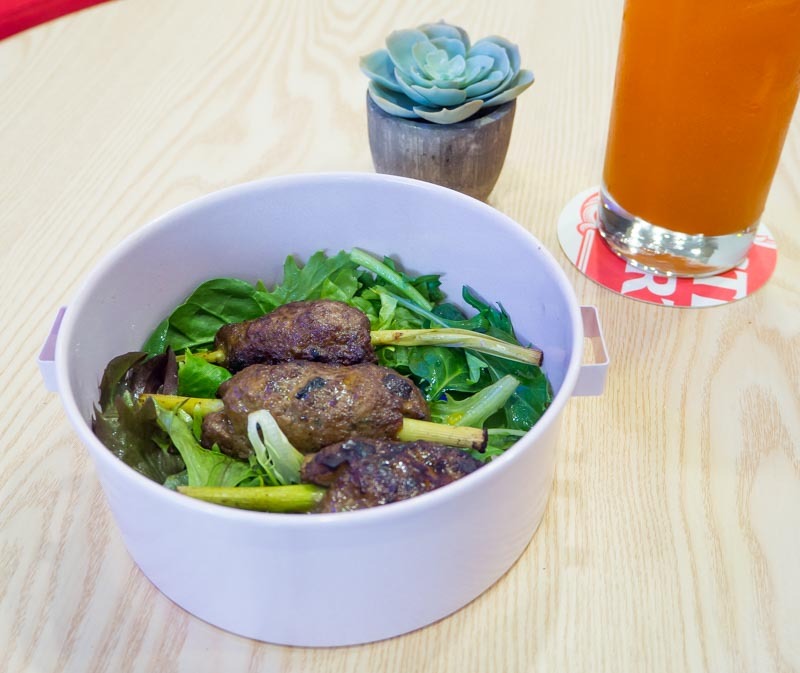 If you’re a meat-lover like I am, you’ll most definitely enjoy the Beef Cheek ($18). 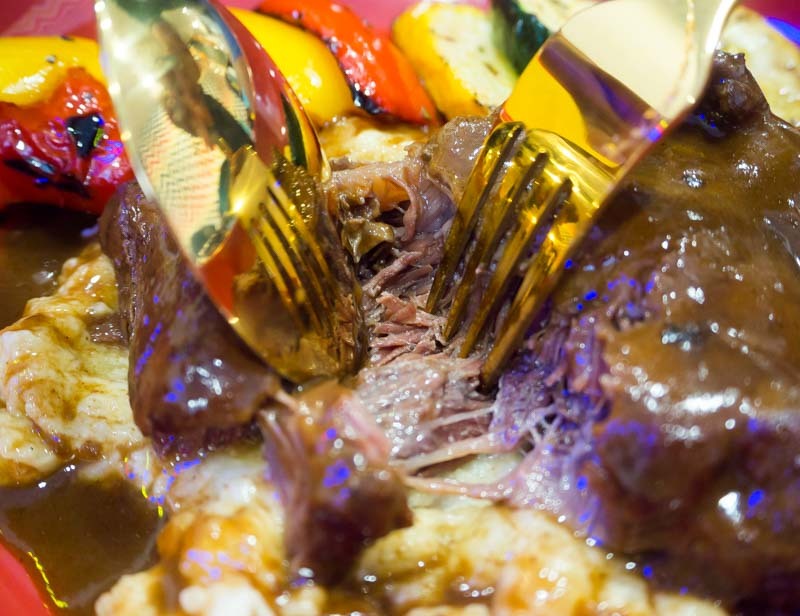 The braised beef was fork-tender and robust in flavour. I fell in love with it on the first bite! The soft meat was balanced out with the crunchy texture of the roasted vegetables, and served together with a savoury gravy that had me smacking my lips for more. 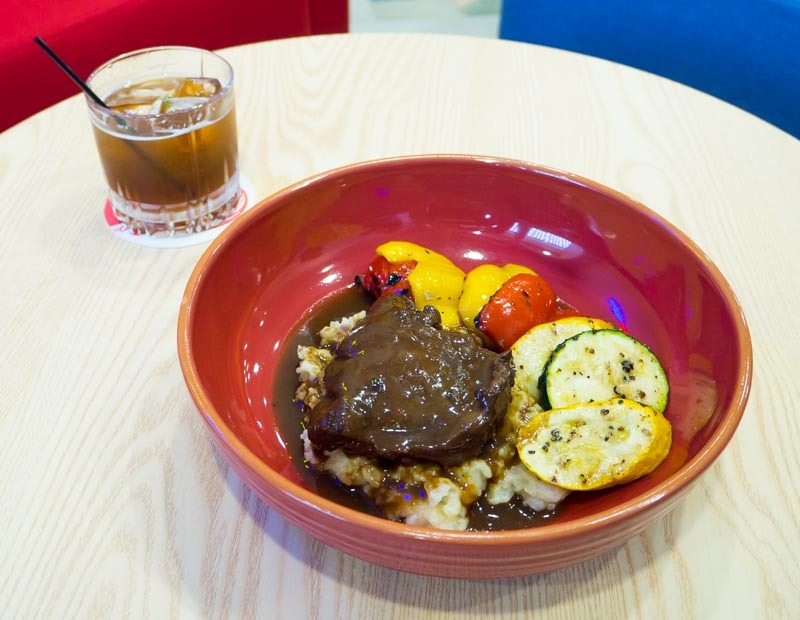 Perhaps my only gripe with this dish was the mashed potatoes, which I found a little clumpy in texture. Scissors Paper Stove also does a mean Paella ($20 for 1 pax, $36 for 2 pax). 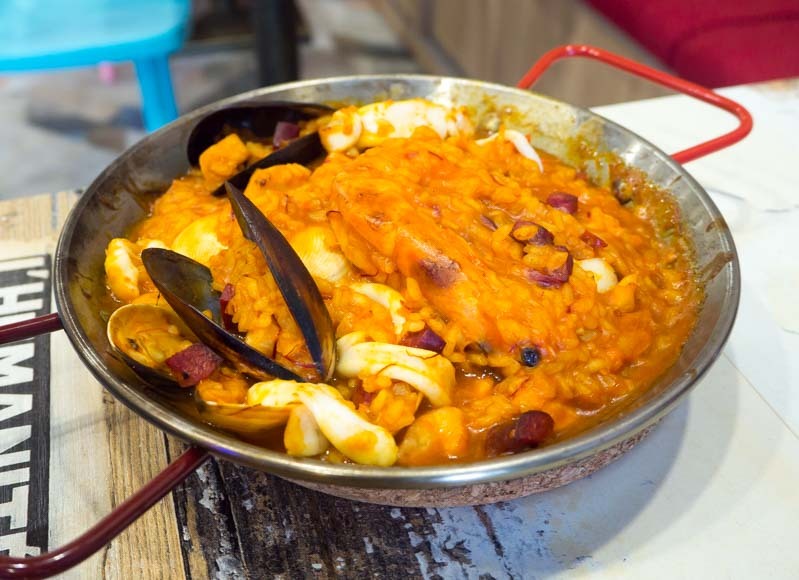 Their rendition comes with bomba rice cooked in a rich lobster bisque and served with prawns, squid and sumptuous chorizo. My companions really loved the dish although I would have preferred the rice cooked a little softer. 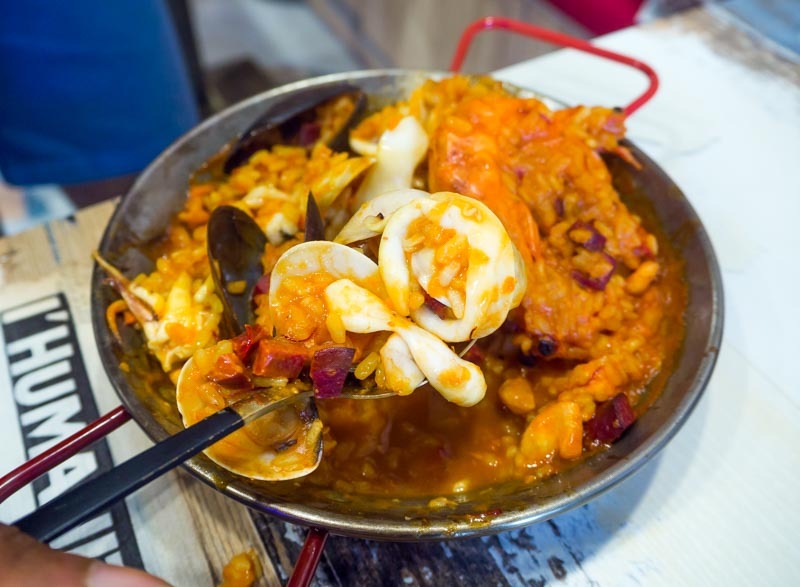 While the Paella had a strong tomato tang, the main draw was actually the generous seafood portion. 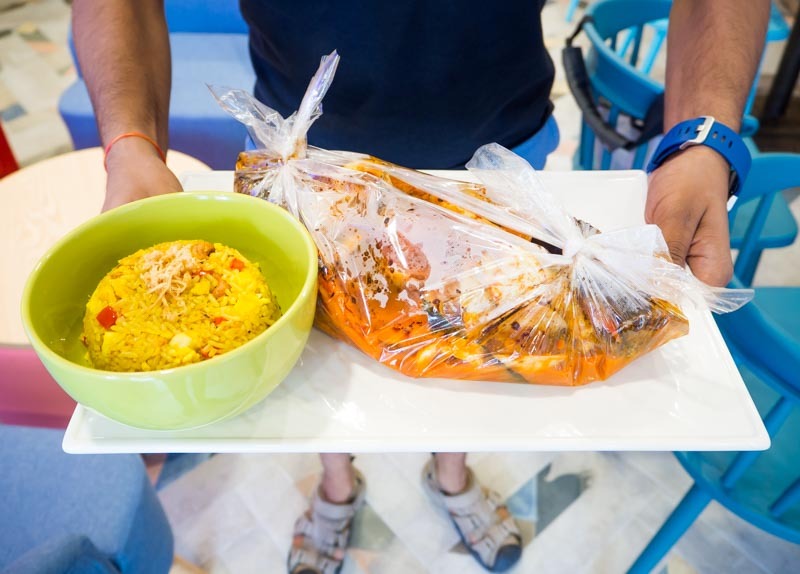 If you’re looking for good value-for-money, this plate is a treasure trove of assorted seafood that you won’t want to miss. Even the desserts are served in the cute tingkats! 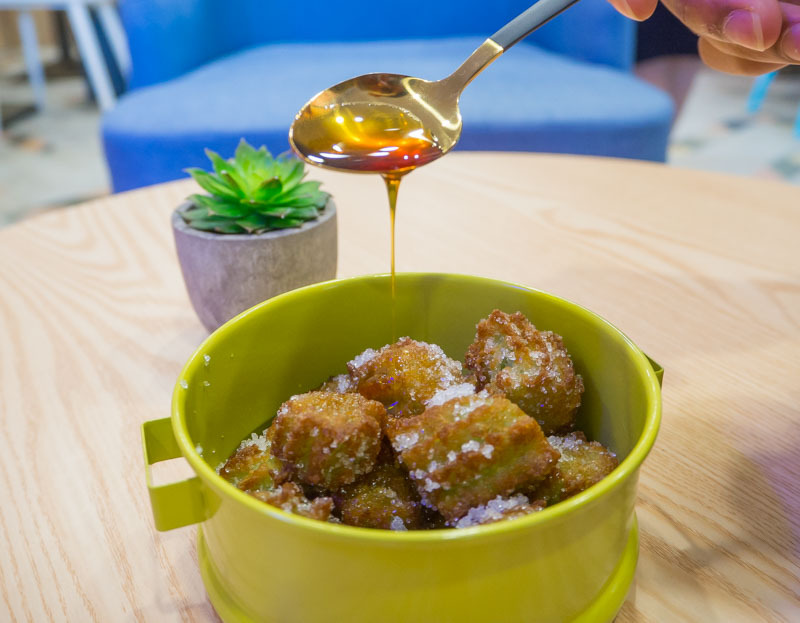 On the menu, you’ll find Western desserts with an Asian twist like the Pandan Churros ($5). This dessert was a tad sugary and didn’t quite need the gula melaka syrup. Nonetheless, there’s no denying the delightful crisp texture of the churros, which is surprisingly hard to come by in Singapore. 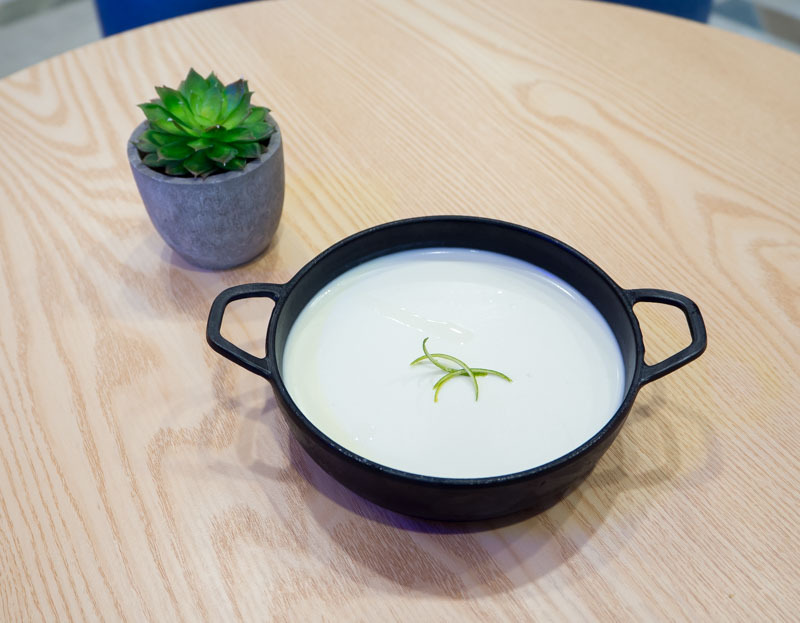 The real contender, however, was the crowd-favourite Panna Cotta ($4). It had a smooth and custardy texture, with a unique touch of lemongrass that gave it a light spice that was really addictive. 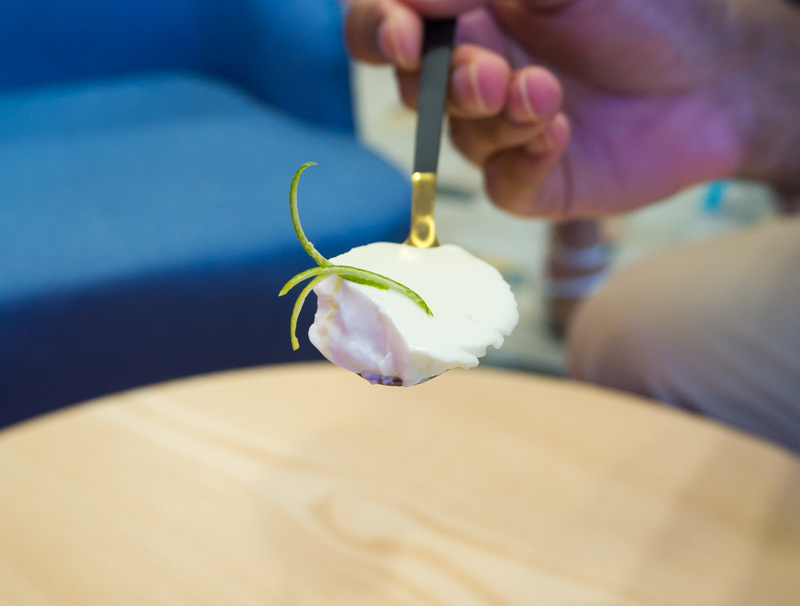 While indulgent, their rendition stood out for its incredible lightness that didn’t leave us with the usual cloying sensation associated with creamy dishes. This dessert was so good, we scooped up every last bit! In line with the Asian-fusion concept, Scissors Paper Stove also does an interesting lineup of cocktails that are surprisingly wallet-friendly. 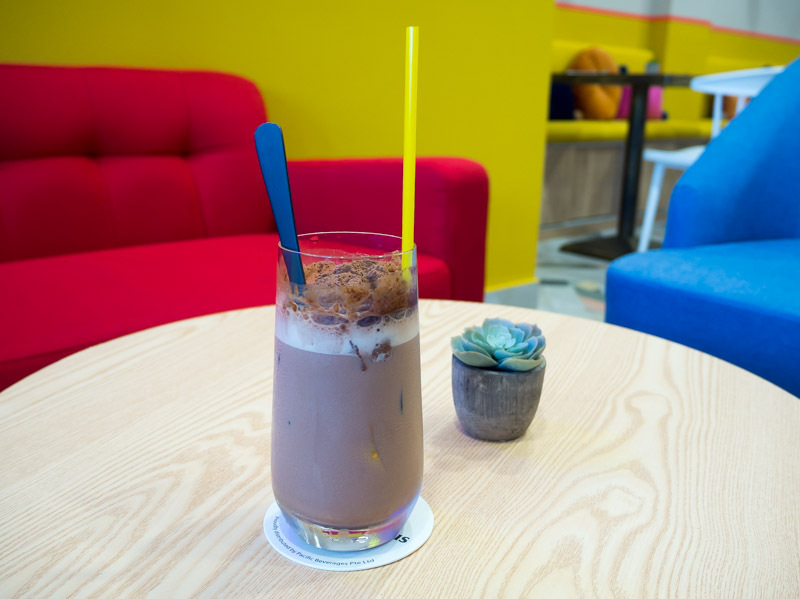 My recommendation is the Tak Kiu Peng ($12), a vodka-based version of Milo Dinosaur! Yes, the overkill Milo drink you order at your neighbourhood prata shop. Filled with amaretto and Milo powder, the drink was chocolatey but finished off smoothly with the vodka. It could use a little more booze if you ask me, but with the undissolved Milo powder on top for me to scoop up at the end, I was kept pretty happy. 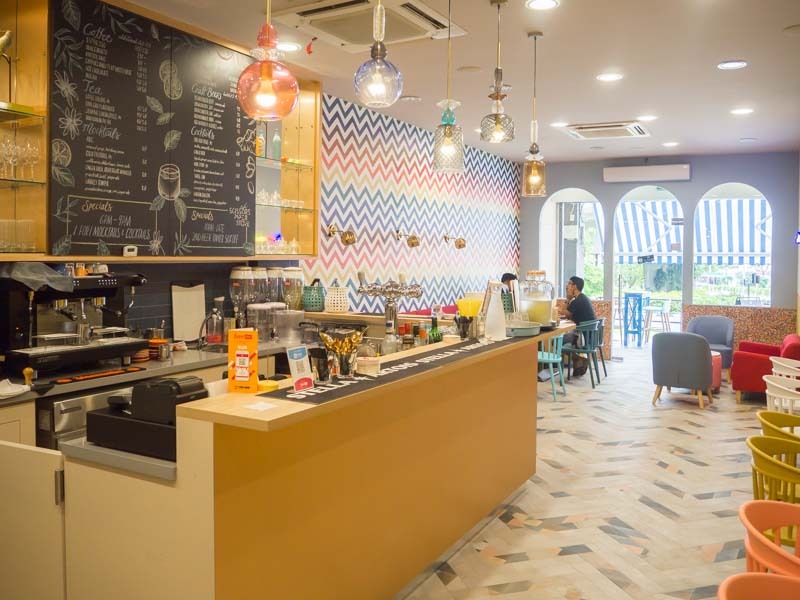 For the affordable price range, Scissors Paper Stove delivers with strong flavours. What I really love about the tapas, in particular, is that they are portioned and priced perfectly for sharing — neither too little nor too much, so you have stomach space to try more dishes. Lovingly made, the dishes are adventurous but strike close to home with familiar Asian flavours. It’s good comfort food, and one to be shared. 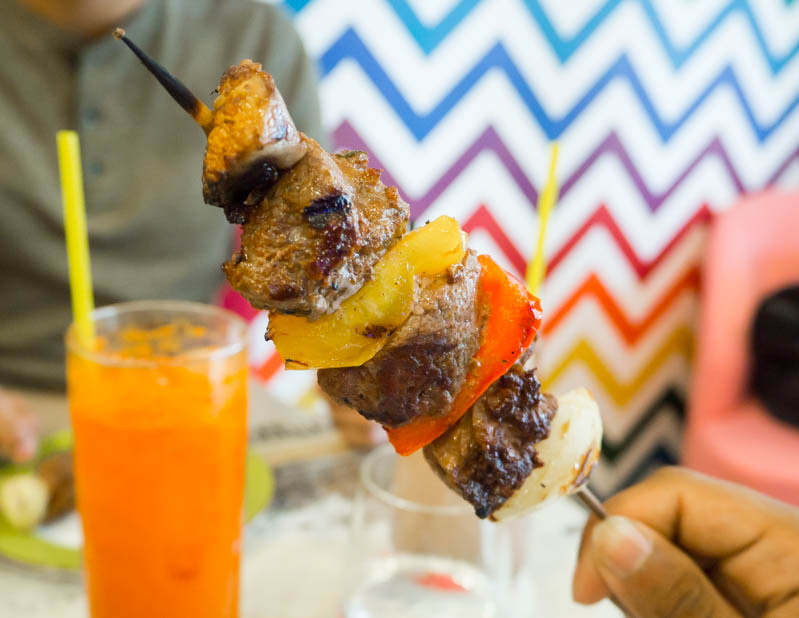 So jio your friends and indulge in an Asian-inspired Spanish fiesta!